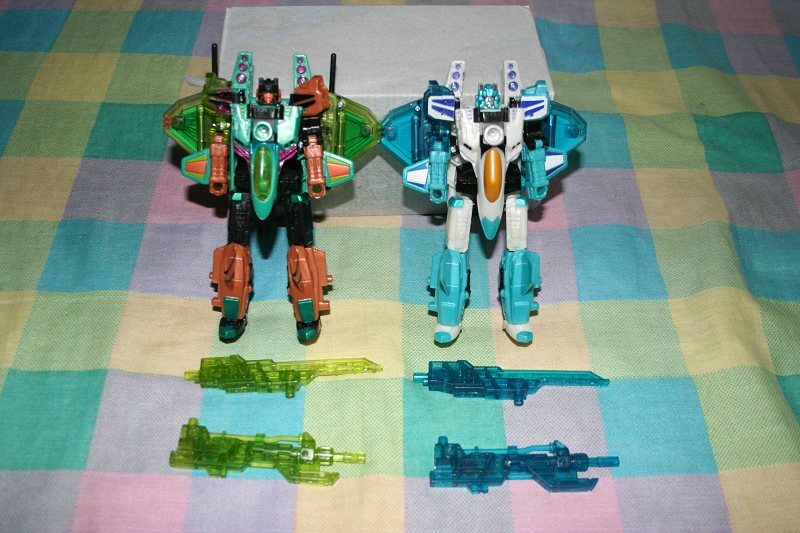 Home » Conventions » Image of Botcon 2009 Exclusive Energon Starscream Repaints – Skyquake and Leozak! Image of Botcon 2009 Exclusive Energon Starscream Repaints – Skyquake and Leozak! 2005 Boards member S250 has shared this new image of a pair of Botcon 2009 Exclusive Transformers with us. You can see the image to the left. Both of the repaints are based on Transformers Energon Starscream – the first is the Skyquake repaint hinted at by Andrew Wildman last week, the other is a cool blue and white design which is speculated to be none other than Leozak! Overhaul's insignia was molded and from the pics I saw of Brushguard, it looks like the molded part was just filled in and a Decepticon insignia was tampographed upon it instead of remolding the area into a Decepticon insignia. And that Warpath used the same mold Brushguard did. Really? I'll have to go dig those three figures out of storage now… could have sworn they remolded it… oh well. Cybertron Overhaul to Cybertron Brushguard. Later used again as Movie Warpath (returning him to an Autobot). so, Laser_Optimus or G.B.Blackrock, which molds were remolded to give them new faction symbols? all i can think of is possibly armada sideswipe, for when he was done as oil slick, right? anything else i'm forgetting? Armada Sideswipe to Universe Oil Slick & Universe Treadshot. Later Remolded into Cybertron Runamuck. Armada Hoist to Universe Ransack. Later Remolded into Cybertron Longrack (returning him to Autobot status) and then he became Botcon 06 Dinobot (making him a Predacon). Armada Jetfire to Universe Spacewarp/Club Exclusive Astrotrain. Cybertron Jetfire to Cybertron Sky Shadow and later again as Movie Jetstorm. There are probably some other examples of Hasbro doing this, but those are the one's I could come up with off the top of my head. G.B. Might be able to help out a little more. I should also note that once the molded symbol was removed it seems to be gone for good as any releases following the release where the symbol was removed and replaced with an tampographed faction symbol, even if they were returning the mold to it's original faction designation, still no longer have the molded faction symbol and have to have tampographed ones used. It has, once– as Energon "Energon" Starscream, the G1-esque repaint. I actually meant outside of that series, or for TC, SW, or another seeker in Classics, or Universe. Maybe somewhere in a 2-pack, or store exclusive. I should've been clearer about that. Hey, I found the reference. No reason given why, nor who the word came in from. Could be an "FP cost effectiveness call," but it might well be something else. Ah, thanks. That's really weird though huh? I mean… I wish I knew it was a Hasbro call or an FP call or maybe even, for whatever reason, the mold wasn't alterable like the Armada molds were? Again, might be something to ask if I ever get a chance… just out of curiousity. The plan was to strike the Autobot symbol, after work had already started on Rhinox the word came in that the tool could not be altered. It'll take me some digging (assuming I can find the reference at all), but I seem to remember Pete actually saying that they didn't feel that they could remove Rhinox's symbol, so they needed an explanation, but that (they felt) the idea that he would homage the Autobots in that way seemed to fit his character. But it was definitely (if I'm remembering right) an after-the-mold-was-chosen decision. I don't think Hasbro played any part in it. It was strictly a cost decision. I don't suppose I've actually responded to this point exactly. I actually agree that to remove a molded faction symbol is probably one of the cheaper things one could change in a remold. Probably quite a bit cheaper than a remolded head (again, just my guess). I'm thinking that FP doesn't consider the cost of removing a symbol as giving them enough benefit, in terms of change to the toy, to be worth putting the money in. A new head is a far more dramatic change, and thus is far more cost-effective, even if it may well be more expensive than removing a faction symbol…. All this is speculation, though. …I guess if they just don't consider it enough bang for the buck then it does. Somebody should shoot this question to Pete at some point. Might be interesting. Well, honestly I have no idea how cheap or expensive it is or not. I've just always assumed it was the cheapest thing they could do given that a lot of different repaints (and intended repaints) have done this with various Armada figures during Universe 1.0 left and right. Yet, they hardly ever do new molded parts unless it's been pre-planned (Classics Starscream/Ramjet, the majority of Universe 2.0, etc.) because of the cost of creating new toolings and such for similar things. As for 06 Rhinox… well, the situation is probably a good question for Pete at some point. Was the mold chosen deliberately because they already planned to have 06 Rhinox have an Autobot symbol? Or, is it possible that they wanted the mold and wanted to retool the symbol and that, for whatever reason, Hasbro stepped in and said no so they just came up with the reasoning for him to have the Autobot symbol? An answer about the scenario that lead to Rhinox having his Autobot symbol would go a long way towards answering the question about whether or not they think it's cost-effective or not. I don't think covering the molded symbols is as cheap as some think. I guess it depends on the mold itself, whether it can be masked or if it needs to be retooled. The fact that FP has never done it for their convention exclusives, makes me think it's not that easy to set up. EDIT: beaten by G.B. Cost-effective sound so much better. One doesn't do stuff like this without being detail-oriented to a rather high degree…. As long as I'm given a modicum of respect, I don't mind that people think my detail-orientation is a bit "absurd." Hopefully, I can use that tendency to provide information that is of value to other fans. Unfortunately (for both fans and for me) that can mean taking the bad side of the same good coin at times…. I couldn't say, for sure, but the fact that FP hasn't done so (when it would have been obviously helpful, such as with pre-Beast Rhinox… explanations notwithstanding) argues that they don't consider it cost-effective. Well, I know the reasons given for the club freebie figures were that it wasn't cost-effective vs. the fact that they were free figures. Which, considering I'm not sure you can argue their cost into the price for the club… sounds plausible. They also stated the same thing about giving these figures new heads when they originally said that they would try to do so starting the second figure… I'm guessing that they've been saving money for the last couple of years to get Heatwave's new combiner head done up. By that logic, so is pre-Beast Dinobot. The point I was trying to make is that, if FP has to pay for the faction remold, it seems they're not willing to do so. True enough… I'd forgotten about 06 Dinobot for some… odd reason. You could very well be right about FP not wanting to pay for faction remolds, but with the evidence at hand it's really hard to say one way or another. It could just be that they haven't had a reason to at any point as there was always an available mold that fit said character they wanted within the character's faction already. Has anyone ever told you you're a stickler for detail? Like to the point of absurdity sometimes. Don't worry it's cool with me though… I think I've gotten used to the way you communicate or something. Anyways, no, FP has never done so, but if Hasbro has done it for crappy store exclusive repaints and won't do remolded heads that often (unless they're part of a planned mass release or something) it should be relatively cheap and easy for FP to do when they are willing to spend money on creating new heads for molds. Edit: Just thought of arguably one figure that FP released that had a retooled faction symbol… Club Exclusive Astrotrain. Sure, you could argue that Hasbro had already done it for them when it was intended to be Spacewarp, but it is still a release that they did that's had it's faction symbol retooled. Hasbro's done it a number of times, yes. I can't recall FP ever having done so…. Hmm… well they could always change the tooling on the mold. Hasbro has done it plenty of times with the molded Armada faction symbols when they want to repaint a figure into a different faction. And they could combine… sorta. Never cared for the claw arm myself. As a big Victory fan myself, I would love that. Works perfect too since Cybertron Prime has a jet mode. Not to much combined.